Contrast that with the settlement after the Second World War. Germany lay decimated, with what seemed indeed a screwing down of nails even more destructive than in 1918, given what we now know to have been the gratuitous bombing of Dresden. That was paralleled in Asia by Hiroshima and Nagasaki, which was an even more evil manifestation of ruthless power. But then the miracle happened. Though there were instances of prisoners being treated appallingly, by the Americans and the French as well as the Soviet Union, as documented by James Bacque (the British seem I should note to have been comparatively decent), this was only in the immediate aftermath of war. Thousands died, over 50,000 according to a rebuttal of the worst case scenario, but it was not long before attitudes changed. So, instead of reparations we had the Marshall Plan, the development of economic integration and through these the entrenchment of political inter-dependency. The result is what we can see now, a Europe in which reconciliation reigns. I should I suppose note in passing, to indicate that some prejudices still linger, the claims of exponents of the theory of relentless German expansionism who aver that, through the imposition of Teutonic discipline on the self-indulgence of Southern Europe, Chancellor Merkel has achieved what Kaiser Wilhelm and Hitler failed to do. The theory is amusing, but even its proponents must grant that it was through logic and finance rather than violence that the Euro was sold to Europe (apart from the gloriously independent British shopkeepers), and there is at least some argument still that the benefits of this uniformity outweigh its disadvantages. This indulgence to the vanquished, the co-option of the German people as equal partners in economic and social and then political activity, was not accompanied by any regrets about the war, and the necessity to have got rid of Hitler and the mindset he represented. This did not mean that the Allies failed to recognize the contribution their own behavior, way back in the aftermath of the First World War, had made to the resentful radicalization of the German people. But despite all that, there was no excuse for the excesses in which Hitler had engaged, and one important aspect of asserting this perspective was the involvement of the German people themselves. In this regard I should note the great contribution made by the Jewish people to universal acceptance of this view. The relentless assertion of Nazi guilt in this regard, as well as collaboration in this on the part of the German people – and indeed others in Europe, though they have got away comparatively lightly – has made it impossible for any except determined outsiders to resurrect Nazi philosophy or practice. And with this failure, the understanding then that Nazism will not be resurrected, it has been easier for the Allies to recognize their own contribution during the twenties to the emergence of such extremism. Concomitantly, the recognition by many European governments of the role their people too played in persecution of Jews has helped to limit sanctimoniousness about the Nazis . In passing I should note that the bending over backwards we see currently with regard to homosexuality may have something to do with the guilt felt about homosexuals too, given how the Nazis treated them, though sadly the equally deserving Roma have not benefited from such indulgence. But I suppose there are limits to what states will do to make up for abuse of minorities, when such recompense might be resented by voters. Acknowledgment of guilt with regard to the Jews was made easier one realizes by the fact that reparation was at the expense of Palestinians rather than the perpetrators of the excesses. One significant aspect of the involvement of the German people themselves in the new mindset that the Allies succeeded in creating was the leading role played by former Nazis and Nazi supporters, particularly those who provided economic or philosophic input without having engaged actively in criminal activity (though it has been argued that that distinction too was not always observed, after Nuremberg had to all intents and purposes wiped the slate clean). I am reminded of this when I hear the Tamil National Alliance (or at least those elements in it who were not forced themselves into collaboration with or at least acquiescence in LTTE posturing or even activity) complain that former LTTE cadres are now with the government. They should study the examples of areas in which reconciliation was achieved successfully after bitter conflict, and realize from what happened in Europe after the Second World War that forgiveness cannot be grudging or carefully calculated always. Of course the process in Europe was helped by the onset of the Cold War. Perhaps one should not give too much credit to those who pursued reconciliation without reservations since the motive was as much self-defence against the Soviet Union as altruism. But even the recognition of the benefits of cooperation through democratic regimes rather than enforced allegiance was a remarkable achievement, and to have got it across to the population at large, a population that had been brainwashed into othering their historical enemies (as one noted in comics about the war as late as the sixties) was an achievement. Later, when the West decided to fight the Cold War through dictatorial regimes, ranging from the Shah in Iran to Mobutu in the Congo, they found that vice brings its own punishment. I hope it is that perception that prompts the present, not entirely perfect, but still better, allegiance to democratic practice. How then have we done, in terms of this model of Reconciliation, which so clearly worked? We have certainly put in place our own Marshall Plan, in terms of the massive infrastructural development that has been brought to the North. Unfortunately, with what I have come to think of as its customary incompetence as far as telling its story goes, government has not made clear what it has done in this regard. There is a perception that everyone knows, but that is simply not good enough. I would also go further. I think one puts things on record not only for others to know, but also for oneself. Clear accounts of what has been achieved, set in context, also help one to see what more needs to be done. Thus, while every time I travel to the North I am impressed by the building that has taken place, the commerce that flourishes, the re-establishment of administrative structures, I can also see shortcomings that greater transparency might have avoided. In terms of what some might think my own characteristic obsession, but which I have good reason to believe is a prerequisite for development, we have not done enough about providing teachers in essential subjects in rural areas, to go with the very attractive schools that have been set up. I was pleased, even a couple of weeks back, to see that we are delivering very thoroughly the services that we continued to provide even during Tiger times, books and uniforms, which sometimes served no purpose in those days when the Tigers saw the vast majority of school children as cannon fodder rather than assets to be nurtured and developed. But though our intentions are much better, we must make sure that the English books I noticed awaiting distribution are actually taught effectively. Another area in which we should do better is coherent planning with regard to what is provided. I am sure much is done, and perhaps the shortcomings I noticed are exceptional, but better systems of accountability would ensure that they are overcome. An example that struck me as particularly unfortunate is the road going up from Mannar to Jaffna. There was much fanfare over the construction of this, and the bridge at Sangupiddy, but I found the road almost impassable. The bridge is certainly marvelous but on either side, in the Jaffna peninsula as well as on the mainland, travel is painfully slow, painful being the operative word. My own view, given the speed with which much was done in the North initially by the forces, was that this road too should have been entrusted to the army. Unfortunately what I can only describe as a pernicious effort to perpetuate a conflict mentality has led to diffidence on the part of government in deploying the army in some areas where its efficiency would considerably benefit the population. I believe too that a model whereby soldiers worked together with those who need work would assist considerably with Reconciliation. My view, that people establish lasting relationships when they play together and work together, has led to efforts to encourage project work as a component of the many educational exchanges that are taking place. It occurred to me then that the same principle should apply to adults, working together on a project that would benefit the community which contributes its labour, on the basis of course of equal remuneration. Reflecting on this I realized that one major problem we face in Sri Lanka is our failure to lay down a clear agenda for the North and the role of external assistance in this. We seem to be stuck still in the mode of humanitarian assistance, whereas by 2010 we should have made it clear that what we wanted was development assistance. I was astonished thus to find that the UN was complaining recently that it had not been able to collect enough funding for food distribution. We should not be engaged still in food distribution, but should rather be concentrating our efforts on cash for work in line with the programmes the World Food Programme engaged in when it first came to Sri Lanka, assisting with the restoration of the Cultural Triangle. The workers obviously benefited, but so did the country, and those who took part in the construction had a sense of pride in what they had achieved. I believe what I term the old UN, the agencies that should be flourishing in a country like Sri Lanka, the ILO and FAO and WHO, along with that splendid American invention when they could not cope with a democratic United Nations, the IOM, should be at the forefront of support for government efforts in the North, as indeed elsewhere in the country. UNHCR of course has a role with regard to the refugees now in India who wish to come back, and we should never forget its seminal contribution to the services proferred to the Internally Displaced in 2009 and thereafter, but its confusion about its role now is what has contributed to the current effort to suggest, confusing what are called old IDPs with new ones, that there are a few hundreds of thousands still not resettled. Fortunately recently efforts have been made to introduce some clarity into the notion of tens of thousands of IDPs still with host families, and I hope those myths can soon be laid to rest, but this should have been done many months ago. We ourselves sadly failed to keep careful track of what were termed old IDPs, and are now faced with allegations that are totally misleading, in part because of the sterling and concentrated effort to resettle the new IDPs. That, I should note, required great devotion, in particular with regard to demining which was mainly done by the army, much more quickly than in similar situations elsewhere in the world, and more efficiently, I should add, given recent casualty figures because of mine related incidents, in comparison for instance with the Jaffna Peninsula where demining by international agencies took aeons while the conflict was in progress. Incidentally the success with regard to resettlement of the new IDPs confirms how sensible government was not to permit free movement from the Welfare Centres initially. We used to point out then that there were three reasons for this, namely the need to demine, the need to ensure basic facilities before resettlement, and of course security considerations. But I can see a fourth too, namely the tendency of those for whom life is difficult in their places of origin to stay on in refugee centres, find work, and also enjoy free lodging and food for a long period of time. 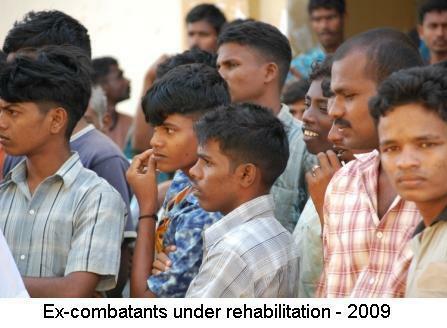 As it is, the manner in which almost all areas in the North are now developing, with substantial populations in place, is a tribute to the policy of ensuring rapid resettlement rather than allowing displacement to continue for years, as unfortunately proved unavoidable in Sri Lanka when the LTTE was in control of substantial areas. To complicate matters, given the internationalization of the conflict and efforts to resolve it during the early part of the last decade, the habit has developed amongst some development partners of asserting principles that have no basis in law or custom. Most recently these efforts have crystaliized around efforts to limit military involvement in reconstruction. 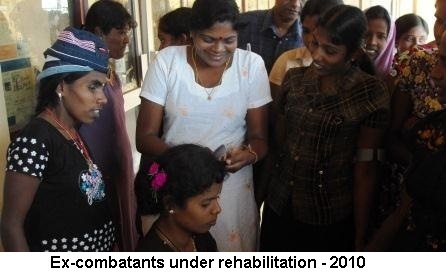 Various pronouncements are made on the basis of what is termed humanitarian practice in a conflict situation, when Sri Lanka is not in a conflict situation and needs developmental assistance rather than handouts. I am reminded of the effort three years ago to create a role for what was termed the Inter Agency Standing Committee, which the then head of the Office for the Coordination of Humanitarian Assistance claimed was set up in accordance with accepted UN principles. Unfortunately for her I had actually read up the relevant documents, which she had not anticipated since I gather it is not the practice of most officials dealing with the UN and INGOs to study the principles on which they are supposed to act. I was able however to show her that the IASC as it functioned in Sri Lanka was nothing like the IASC as proposed by the UN body that had discussed the concept, and that in any case that concept was a suggestion that had not been formally proposed and that Sri Lanka had not accepted. I should add that those in the Foreign Ministry I tried initially to explain this to had no idea of the IASC and no idea of how to deal with it, except the classic double edged sword that Sri Lankan officials used with such disastrous consequences, either accepting blindly whatever the West proposes, or else objecting doggedly to even well meant suggestions. Fortunately, the situation being serious three years ago, they were prepared to listen to a serious detailed exposition of the actual situation, and accepted the point I made in that regard. That was the end of the IASC which had previously made grandiose pronouncements as though, to use the preposterous phrase the EU had coined for what they termed Modes of Operations, they held the balance between the elected government and a terrorist group. When I pointed that out, the Modes of Operation were forgotten, though there was a last ditch effort by the then Canadian High Commissioner, whose writ still seems to run in Ottawa, to resurrect it. I suppose all this was what led OCHA then to tell me that I had won, though I had to point out that this was emphatically not the case, given my affinity with RAB Butler who always played the game and always lost it. In fact we have continued to be patronized outrageously. All I had achieved, in terms of the mandate of the Ministry of which I was Secretary, to coordinate humanitarian assistance, was the acknowledgment that government was in charge and aid programmes had to be developed in collaboration with relevant Ministries, and monitored by them. The acknowledgment in fact meant nothing, without careful monitoring, and since we were not capable of that, most aid agencies continued to do what they wanted, producing occasionally reports that were never read so that they could get away with whatever they wanted. And the IASC was replaced by the Coffee Club, led by the more critical of the International NGOs, which continued to make extravagant claims for its members and trot out what they claim are IASC guidelines without checking on their validity or relevance. Sadly, with the abolition of our Ministry, and the movement into development mode, which was of course essential, we did not ensure that structures were in place to ensure compliance with national plans in the development and implementation of aid projects. Thus we find now the old hoary devils being resurrected and no idea in government, with its lack of institutional memory, of how to point out the illogicality and impropriety of claims now being advanced. So we find that the Paris Principles with regard to aid, developed with such fanfare some years back, when the world was more balanced, have been totally disregarded in this particular area, though I should note that more principled nations such as India and Japan have been a welcome exception to this, with their understanding of how a democratic society should actually function. I should add though, in fairness to OCHA, that one of its more perceptive officials told me, just before he left, that he felt OCHA had made a mistake in Sri Lanka. Most of its employees, he said, had experience of working in Africa where often the writ of government did not run, and they had thought Sri Lanka was like that. This, I suspect, to give them the benefit of the doubt, was why they had assumed an inflated idea of their own role. My own view was that was not their fault, and we ourselves should have made the position clear, whilst expressing appreciation of their work at a time of crisis. However, when I told the Head of OCHA in 2009 that I assumed they would leave by the end of 2010, they did not demur. That they are still around, and still making plans without adequate consultation of government, is our fault. The failure of government to have proper planning meetings when Ministers and Ministries change, and make provision for continuity and informed understanding of existing situations, will however continue to plague us, given the breakdown of administrative principles, which results in dedicated individuals having to work twice as hard as they need to, with no awareness of the context in which they have to perform. Had OCHA been around in 1945, I suspect Germany and Japan would never have developed, and reconciliation with those who had vanquished them would not have occurred. Indeed I sometimes wonder whether the attack on UN headquarters in Baghdad soon after the conclusion of the American invasion of Iraq, was a godsend for the Americans – though unlike with Germany and Japan they made a right old hash of that business even without the UN monitoring their activities. Of course that war was totally unprincipled, as indeed we can see from recent accounts of Condolezza Rice’s memoirs, which suggests a level of self-serving wickedness I had not thought possible in someone who clearly understood how disgusting Donald Rumsfeld was. When you count up the numbers of those who have died in Iraq in the last few years, you realize that not just self-interest but also solipsism always trumps morality. But even in Afghanistan, where the UN sanctioned war in response to appalling terrorism, can you imagine how the US and its allies would have coped had international agencies refused to cooperate with the military, with some of them actually trying to collect evidence of war crimes? Even without such encouragement, a fair number of Afghans seem to have been driven to desperation so as to go back to supporting the Taleban, which I can only ascribe to the stunning insensitivity of the conquerors who got so drunk with power that they then went and attacked Iraq as well, and allowed the theory to develop that Afghanistan had also been the victim of prejudice against Islam. I suspect something similar would have happened in Germany and Japan had Navi Pillay been dancing around Europe at the time, demanding that Churchill and Truman be tried for war crimes, and appointing her friends to produce a preliminary report to claim that all allegations are necessarily credible. With massive funding being provided by what could term interested parties to Germans who resented the defeat, as well as to others trying for patriotic reasons to get rid of the military governors of the various sections of Germany, there would have been chaos. And imagine if this was happening simultaneously in both parts of the country, the Soviets encouraging dissidents in the West while the Americans funded right wing people in the East. Fortunately both sides were less subtle in those days, and blunderbuss like behavior was easier to deal with, so we have a striking example of how to get both development and reconciliation right. At the risk of repeating myself, given that I have spoken on this subject previously, let me run briefly through what we have got right. Further information can be found on the Reconciliation Office websites, and in particular www.reconciliationyouthforum.com, while www.peaceinsrilanka.org has a section on Development as well as a section to set the record straight with regard to various allegations. Firstly, we have resettled extremely swiftly and safely, and have provided much better infrastructure in terms of roads and schools and medical facilities than those areas had previously. We have facilitated commerce, and have provided the wherewithal for agriculture and traditional occupations with a liberality not experienced previously. That that sort of kick-start can work has been demonstrated admirably in the East, which is experiencing an economic revival that what I have long considered the most promising area of the country richly deserved. 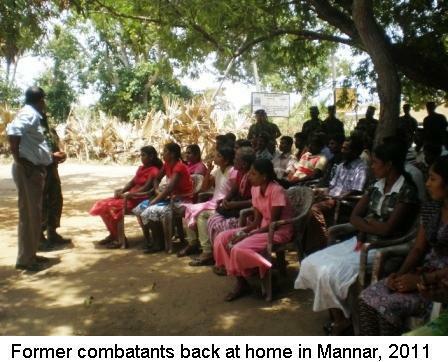 I need hardly add that we did a great job in looking after the displaced in 2009, and the vast majority of those who escaped from the LTTE appreciated our efforts. Of course things were not perfect, given that the numbers were greater than we had anticipated, and we did not prepare well enough, having planned more elaborate arrangements for what we thought would be smaller numbers. We wasted some time on that but, when the influx did come, the effort that was put in was tremendous. I do not think enough has been said about the magnificent way the civil authority and the military worked together to get things to an acceptable level. The UN and other agencies of course did much, but my abiding memory is of an early visit when we had had a very long day, and the Competent Authority suggested around 5 pm that the UN come with him as he was going on to supervise the preparation of yet more ground for shelters. They told him politely that they were forbidden by their internal rules, I assume relevant ones this time, to stay out after dark. I was reminded of this last week when we were working late in Vavuniya and the NGO vehicle carrying my colleagues had to leave early because of safety considerations. But I suppose it is right that, this being our country, we have to make that extra effort which of course paid employees must avoid, for the best reasons in the world. I remember the intense efforts of the Government Agent of Vavuniya and her staff, and of the Government Agents from Kilinochchi and Mullaitivu who looked after their flock, with support from their staff who were also residents of the camps. I remember the extraordinary input of a range of doctors who worked impossible hours, and also the medical personnel who manned the primary reference points that so many thoughtful NGOs had set up. I remember the principals of schools who made sure that children got back into a routine, and the Education Department officials who swiftly supplied uniforms and books, even for pre-school children. None of this is recorded in the morally repugnant selectivity of Kiki Darusman and his ilk, who can only use the term ‘discipline’ to describe terrorists, reflecting the perverse world view they wish to propagate. We can take credit too for the manner in which surrendees were treated. I have spent much time with them since 2009, trying then to get them to play games when they were not sure what would happen to them, observing a young mother with the baby she had given birth to in the Centre while another drew a love heart. I watched them a few months later celebrating Independence Day with sports competitions and practicing beauty culture and a delightful concert by the girls at which they made a presentation to the young Lieutenant who had charge of them and seemed much younger than them herself. More recently I have seen entrepreneurship workshops at which they made business plans, the first very sophisticated group thinking of construction companies or agri-business, the next one making and marketing school bags and hats. 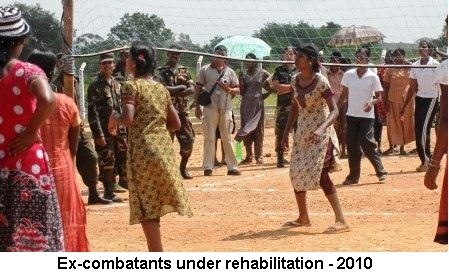 I have sent youngsters, Sri Lankan and foreign, to teach them English, and was delighted at the camaraderie that was established, and which they noted existed also between the former combatants and the staff of the Commissioner General of Rehabilitation. I suppose the prejudice that even the more intelligent members of the international community feel came home to me most forcefully, when one of them objected to the appointment of a military man as Commissioner General of Rehabilitation. I asked her whether she did not want the best for the youngsters, having despaired myself of appropriate programmes when a civilian was in charge. Such dogma was unbecoming, and I am glad that everyone since has appreciated the work the Bureau has put in, and in particular the speed with which almost all former combatants have now gone home. However in this regard, as in others, I believe that much more needs to be done, and I am sorry that the Bureau was not also given a clear mandate with regard to reinsertion and reintegration. Much funding has been made available, but programmes have not been drawn up consistently and coherently, and the absence of clear responsibility in this regard has prevented the monitoring and support that these youngsters need. The Ministry of Disaster Management and Human Rights, with sterling support from ILO, drew up a blueprint but, in the proliferation of authorities that our system entails, responsibility was initially with another Ministry, for which this was simply a tiny part of its work. After the election in 2010 a separate Ministry was created, but as usual there was little continuity, and when there was a change of Minister subsequently, the idea that there should be clear responsibility also for ensuring that training was productive and that the wherewithal for employment was made available was no longer current. More indeed can be done about employment in general. 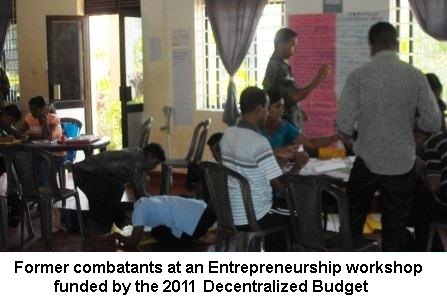 Though much effort has been expended on vocational training, the courses conducted at various levels do not also provide the soft skills needed to ensure personal initiative and entrepreneurship, as well as the ability and motivation to pursue self-improvement as well as self-employment. This is of course a general problem, our educational system still stuck in the mould created by Thomas Macaulay, to produce obedient clerks for government service. I realized nothing had changed with regard to the bulk of our students, when I found some Arts students from Jaffna University last week having had no proper training in either English or IT, though the University system has tried to insist that these be compulsory core subjects on any course. But, whereas some science courses have moved steadily ahead, and even arts courses in some universities, we are still in many universities producing unemployable graduates, and skilled labour that can only labour for wages. I should note that better planning for education is something through which we can also ensure that the particular talents of the Jaffna Peninsula are put to good use. One factor to which I believe government has not paid sufficient attention is the difference between the Wanni and Jaffna. The results of the recent election showed that in the Wanni there was significant appreciation of the basic services government had provided, whereas in Jaffna there is need of more if reconciliation is to proceed apace. 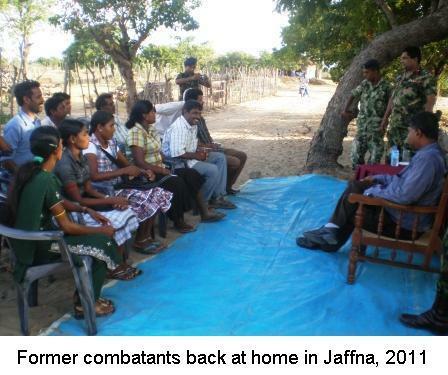 Despite the tensions and violence of the period in which the LTTE still functioned, Jaffna had basic services and it is therefore necessary, following the elimination of the terrorist threat in Sri Lanka, to provide much more. Government should be proactive in promoting intellectual and cultural activity, and in involving civil society in planning and programming. There should also be intensive programmes to involve the students of leading schools in projects together with their counterparts in the south. I am aware that much is being done in this connection, but it is sporadic in its impact. Rather, active use should be made of social groups, Interact Clubs, UNESCO activity groups in schools, St John’s Ambulance Brigades, religious bodies, to ensure that students not only work together, but that they also think and work together. Special measures should also be taken to promote applications and recruitment to the police and the armed forces, not only cadeting in as many schools as possible, but also familiarization camps for youngsters to encourage them to experience active involvement with their peers from other communities. We should also try to open the minds of these youngsters to the world at large, for instance by setting up joint study groups across schools to establish contacts with particular countries, encouraging the various embassies in Colombo to engage in outreach programmes in this regard. The supply of pictures and films and music to such associations would be beneficial all round. Whilst all these positive new initiatives are indicated, as doctors would say, we also need to pay more attention to resolving problems. Most prominent amongst these is the vulnerability of women and children, and we need much better structures to provide them with support and counseling. At the first meetings of the District Reconciliation Committees we have set up, this was perhaps the most urgent topic raised, and I am happy that it was approached without the prejudices that have prevented suitable remedial action. Far too often we are told that the presence of the military is the reason for the problem, but when I ask for specifics, hardly any are given. I was given this generic complaint even by one of the brighter and more positive thinking of ambassadors, so I can just imagine what the Coffee Club get up to when they meet, in whatever new incarnation they have created for themselves. The social workers in Kilinochchi pointed out that there had been a great increase in the number of unwanted pregnancies, but still there is no hospice for such cases in the area. There is also a lack of trained personnel in this and related fields while, as has become endemic in Sri Lanka, there are so many different officials who might be responsible for care that cases can easily slip through the net. It is essential that systems are set up in small geographical units to monitor the situation, to involve educationists and medical personnel also in support groups, and to ensure that hotlines are available and responded to promptly. It is also particularly important that greater attention is paid to mental health, in addition to reproductive health. I should note again that much is being done, and I was happy to see in Kilinochchi a ‘Happiness Centre’ as it is termed in the Maha Vidyalaya, one of several that have been set up, to look after children with learning disabilities whilst also monitoring others in the school. But there should be more of these, and more trained personnel, on the lines perhaps of the Counselling Service set up in the East a few years back. There should also be better coordination, to make sure that the availability of support is not just a matter of the right people being in place in any particular area. Other matters in which more concerted action is needed include remedial action with regard to one of the main reasons for conflict, namely the divisive and exclusionary language policy that was put in place in the fifties. That was in theory changed in the eighties, with a constitutional amendment, but nothing was done about this until the Ministry of National Languages introduced regulations to ensure bilingualism in the public sector five years ago. Training facilities however are inadequate, and in any case much more should be done in schools, and to produce more teachers. This year the budget speech laid great stress on this, but I believe there is need of dedicated effort in this regard since existing institutions have failed to deliver. In this regard, though the Ministry of National Languages has shown extraordinary commitment, it needs to ensure conceptual changes in the manner in which government policy is implemented. Another area in which the Ministry, which also includes Social Integration in its brief, has contributed significantly to resolving problems is through the mobile secretariats it operates to help with documentation etc. But this too is an area in which more thorough and swift action is needed, as well as clearer guidelines to deal with conflicting claims with regard to land and property. In this, as in so much else, we find that the breakdown in administrative efficiency causes continuing problems which is why I believe that, if Reconciliation is to succeed, we also need much better training for public servants and the development of a new ethos which ensures prompt and courteous service. The fact that letters are not responded to promptly, and indeed some public servants believe that they are required to let letters lie unanswered for three days at least (which is how they interpret the directive that responses should be sent in three days at most), is symptomatic of a lack of concern for the citizenry which can prove disastrous. Given the sensitivities roused by the conflict, it is obviously essential to ensure that there is no room for imagined slights or neglect. I have refrained from commenting on the assertions, put most forcefully by the more bitter elements in the diaspora along with a few relentless Western observers, that reconciliation cannot be achieved without retribution. It is clear from their arguments and descriptions that this is what they mean, though they couch their claims in terms of accountability. With regard to accountability itself, what needs to be pursued is clarification, in particular to assuage as best possible the grief of the bereaved. We need to investigate queries about alleged disappearances, a process that is finally being conducted with an urgency that should have been displayed earlier. Unfortunately the real grief of those who are unwilling to accept that their loved ones may be dead has been complicated by wild allegations, including claims that there was secretiveness about former cadres. Visits were permitted from the start to those undergoing rehabilitation, as I have observed on all my visits, and few restrictions are placed on these. The last time I was there I saw a lady with half a dozen girls, one of whom was her daughter. The rest were friends, and they all said that they had had parental visitors too, though not as often as their friend, whose mother lived very near. Registration as the cadres came through was a transparent process, and the ICRC indeed also registered 10,000 of them. 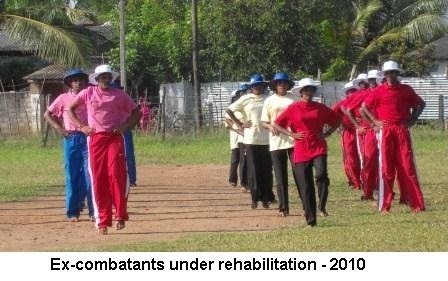 International agencies were in and out of those detention centres from the start, though some resentment was caused, and then exploited by various commentators, because government made it very clear that responsibility for rehabilitation belonged to the Sri Lankan state, not external actors. Meanwhile the ICRC continued throughout to provide its admirable services with regard to the imprisoned, having lists of all those in Boossa and visiting regularly. But we must continue to be sensitive. The unwillingness of parents to accept that their children might be dead is apparent from the fact that there were several representations to the LLRC about incidents that had occurred in the last century. Unfortunately, though commissions of inquiry were held in the past, their work was not comprehensive or well reported. It seems too that there was continuing uncertainty in some cases because of ongoing conflict. However, now that we have peace, we should establish systems like the one in Vavuniya that has received queries from all areas over the last couple of years. So far these there have been just a few thousand and, though more may come in, it would seem the numbers we are concerned with are far fewer than is heard from the more vociferous opponents of reconciliation. Finally there is the question of the possible political changes that are currently being negotiated. I believe I should not discuss content since in theory we are supposed to maintain confidentiality. As the new kid on the block as it were, I think I should avoid the propensity to leak that some of my senior colleagues indulge in. But I should say that I believe we need to move quickly, and I hope very much that we will dwell on the many areas in which consensus is within easy reach, which will help us to realize that there is little that divides us, much more that binds us together. Language, employment and empowerment on the basis of equity is what was requested to begin with, it is what we should supply without stint or grudge. Doing so is not difficult if we are committed to reconciliation. I recall now what Tarzie Vittachi, who recorded the first outbreak of racial violence in 1958, told me in the eighties when I asked what he thought was required to solve the problem. The solution was easy, he said, but he did not think it was likely to occur because it required generosity of spirit, and this he said J R Jayewardene had never possessed. The answer may seem facile but I believe it was prophetic, given that in the eighties most of us did not think things would get so much worse so soon. But Tarzie turned out to be right, and things had to deteriorate further before we were all able to realize that we had to love one another, or die.